Double X Science: What's on your wishlist? Attire yourself in science! Double X Science gear is always fashionable. Our store has infant wear, mugs, and t-shirts, all decked out with our logo and motto. Add some Helix Pantyhose and you are dressed for science success. 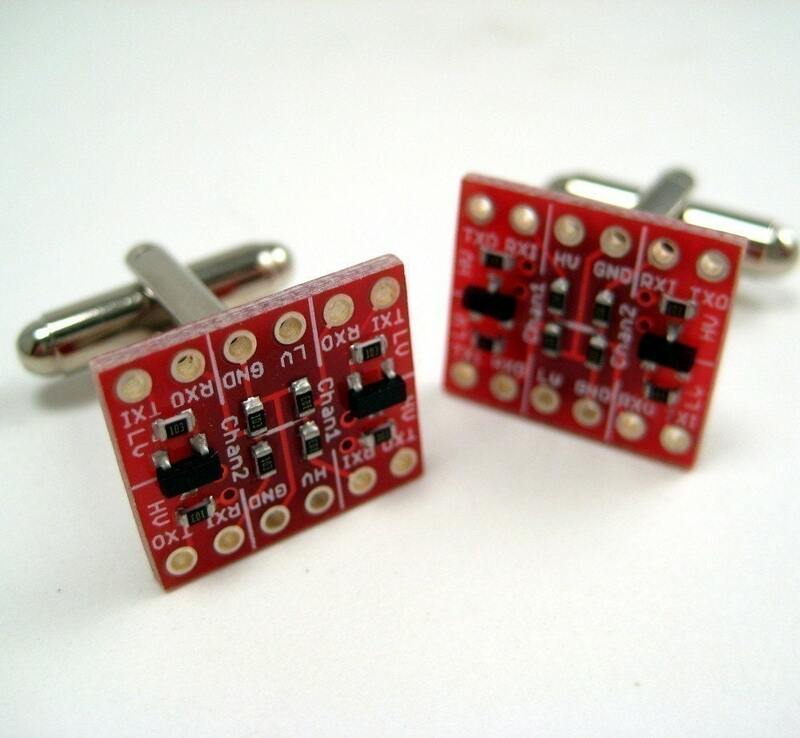 Once dressed, add eye-catching red circuit board cufflinks ($16) from Digibling. Digibling highlights electronics components jewelry. SurlyRamics is stuff full of science necklaces and earrings. Declare your love of science ($18, pictured) or the scientific method ($18, pictured). Maybe Feynman diagrams ($22, pictured), amonites ($22, pictured), or chemical formulas are more your style ($18, pictured). Looking for more molecules? 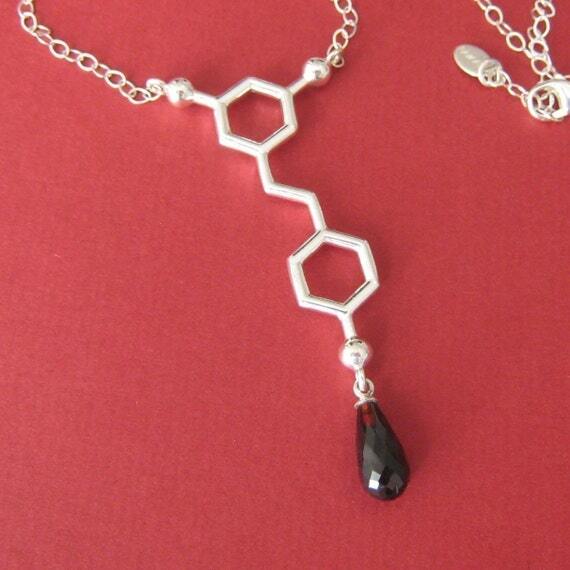 Made with molecules by Raven Hanna has beautiful chemical compound jewelry and ornaments made of sterling silver (from $25). 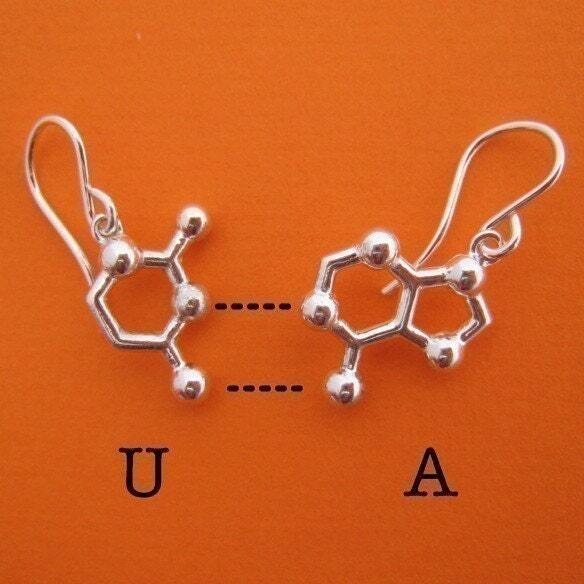 Resveratrol ($130, pictured) or a couple of DNA bases ($50, pictured) may be more your style. Once dressed and ready to go, dress up your home. Thinkgeek offers a periodic table shower curtain ($30). Artologica recently revealed her petri dish ornaments ($15). She is well known for her science paintings (from $35), also available in the Etsy shop. There are many a headphone user and many nighttime music listeners. Bedphones ($30) are perfect for the sleeper who needs to listen to music that a sleeping partner may not wish to hear, and they turn off when the listener falls asleep. Nifty! To wake up the next morning, use this water powered clock ($12) available at Thinkgeek. In the market for books? There are many science books for the scientists and science interested. Start with the Open Laboratory series (from $7.50) highlighting the best of science writing online. Maybe you have a cook who is interested in the chemistry of cooking. They might want to check out Cooking for Geeks or Modern Cuisine: The Art and Science of Cooking. Do you love gadgets? Do you have the newest smartphone or tablet? Perhaps you’ve already checked out the Nexus 10 tablet from Google (from $399) which arrived last month. The Nexxus has arrived to generally good reviews to compete with the standard iPad (from $399) tablet size. Google and Apple have also gone “mini” with the Nexus 7 (from $199) and the iPad mini (from $329), respectively. Looking for a small, transportable "normal" size keyboard for that iPad or iPhone? Look no further than the Cube Laser Digital Keyboard ($180). What about other great gadgets? The DOTKLOK (from $150) is an open-source and hackable digital clock. It also consumes 2W for power! Runners and cyclists who love their gadgets may like the Garmin Forerunner 610 GPS watch ($320). Track your workouts, train like a pro, and analyze all the data this watch feeds to you for the height of fitness. If DNA is your thing then artwork of your personal DNA is the way to go. Get a kit from DNA 11 and have your personal DNA run on a gel and transfered to a beautiful piece of art (from $199). Perhaps the ultimate in science and technology applied to a single person is having your personal genome sequenced. 23andme ($299) offers a kit to have your DNA genotyped or visit Knome ($4998) for full genome sequencing. There are a number of companies available for personal genotyping and genome sequencing for a range of cost. Another option is to join the Personal Genome Project, and for full disclosure and sharing of your genome with others for scientific purposes, you can have your genome sequenced as a donation to the organization.